Born in Ontario on 11 January 1843, he came to Winnipeg in 1879 where he established the first real estate firm in the city. 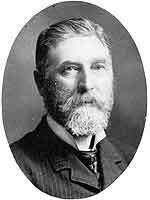 He was in business partnership with William H. Cross between 1887 and 1902. He was a founder of the Winnipeg Real Estate Board, in 1903. He was married to Sara Johnston, with whom he had daughter Sara May Crotty and son Thomas Henry Crotty. He served a single term on the Winnipeg City Council (1885). He had moved to British Columbia by 1911. He died in Victoria, BC on 23 September 1923.